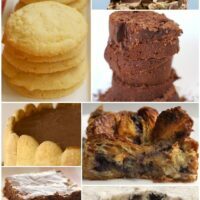 If you find yourself looking for something a little different in the cookie world, look no further than these cookies. 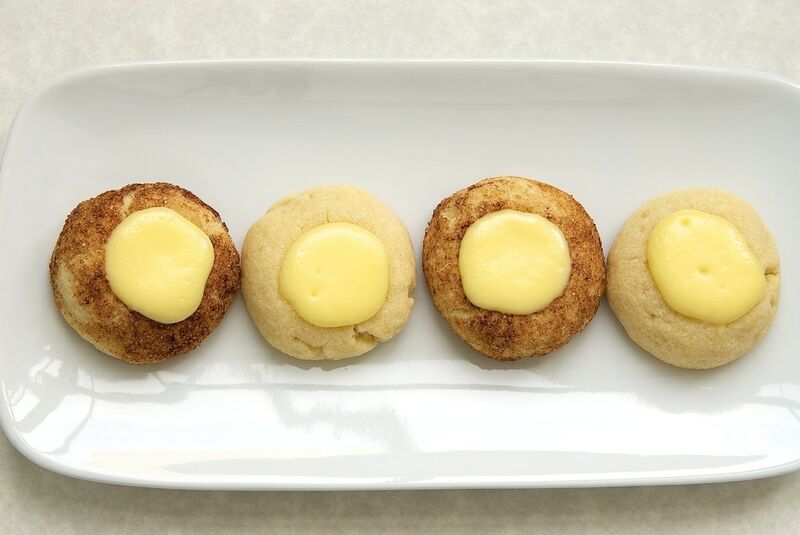 Thumbprint cookies certainly aren’t anything new, but the addition of a cheesecake filling is worth some excitement. The cookies themselves are very simple in flavor. They are made with just a few ingredients. 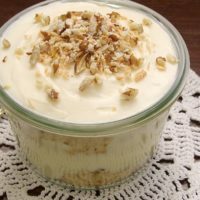 Their simplicity combines magically with the richness of the cheesecake filling for a wonderfully delicious dessert. There’s not a lot of obvious flavor happening in the cookie dough. I contemplated adding a bit more sugar or augmenting in some other way. Instead, I decided to roll some of them in cinnamon-sugar for a Snickerdoodle-like variation. Then, I could compare the two and decide which works better. Honestly? I can’t pick. I love them both! The original version is not overtly sweet, but the cookies are just lovely. To me, the simple cookie serves as almost the crust to the cheesecake. If you’re a big cheesecake fan, you’ll enjoy that the focus is decidedly on the cheesecake filling. With the cinnamon-sugar version, you get more flavor and sweetness in a quick and easy way. 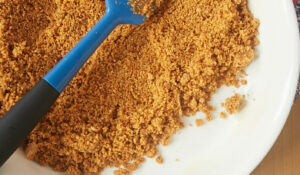 You can use a commercially available cinnamon-sugar, but it’s also very easy to make your own. The most common proportions are 1 tablespoon of cinnamon per 1/4 cup sugar. One of the perks of making your own is that you can adjust that to your taste. These cookies are definitely a departure from standard cookie fare. And that’s a very good thing. Adding cream cheese is pretty much always a good idea in my book. That beautiful, delicious filling really elevates these thumbprint cookies into something quite special. Scroll past the recipe to find out how you can win one of my favorite cookbooks. Using an electric mixer on medium speed, beat cream cheese until light and fluffy. Add sugar and salt. Mix until smooth. Add egg yolk, sour cream, and vanilla, and beat until smooth. Refrigerate for about 30 minutes. Preheat oven to 350°. Line baking sheets with silicone liners or parchment paper. Using an electric mixer on medium speed, beat butter and sugar until light and fluffy. Add salt and egg yolk, and mix well. Reduce mixer speed to low. Gradually add flour, mixing just until combined. 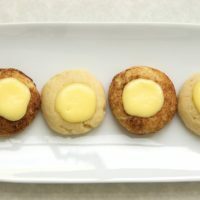 Using 1 tablespoonful of dough at a time, roll dough into balls. If desired, roll each ball in cinnamon-sugar. Place cookies about an inch apart on prepared pans. Make an indentation in the top of each ball with a small tart tamper or the handle of a wooden spoon. Flour the tamper or spoon if needed to prevent sticking. Bake 10 minutes. Remove from oven and make indentations again. Bake 8-10 minutes, or until the edges begin to turn golden. Cool completely on pans on wire racks. After cookies have cooled, preheat oven to 350° again. 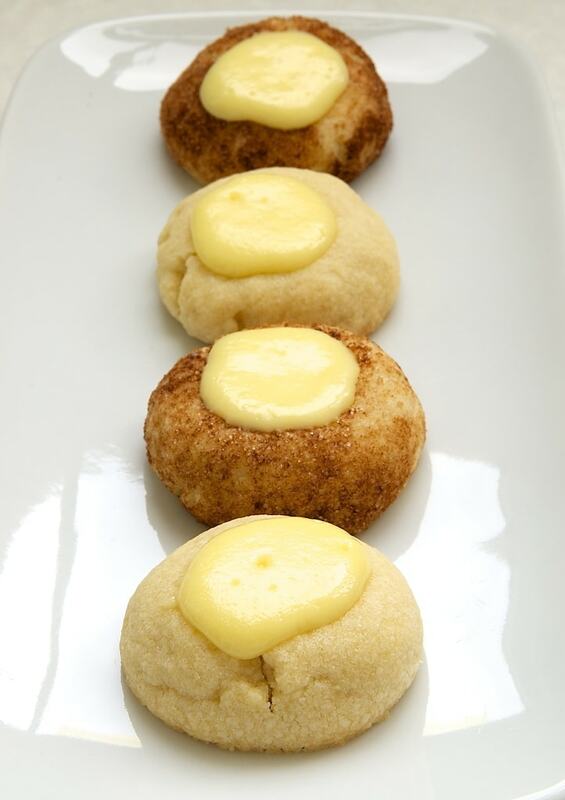 Fill indentations with about 1 teaspoon of cream cheese filling. Mound the filling slightly. Bake cookies 7-8 minutes, or until filling is firm. Cool cookies on pans on wire racks for 5 minutes. Then, transfer cookies to wire racks to cool completely. Transfer cooled cookies to an airtight container. Place waxed paper or parchment paper between layers. Refrigerate at least 4 hours before serving. 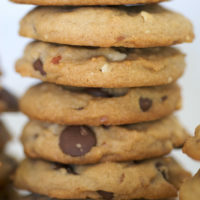 Allow cookies to sit at room temperature for 15-20 minutes before serving. Recipe adapted from Martha Stewart’s Baking Handbook. Recently, I had a bit of a realization that I’m not using my cookbooks as much as I should. So, I’ve decided to make it a point to use them. And, you are going to benefit from that, too. About once a month, I will make a recipe from one of my dozens of cookbooks and give you the chance to win a copy for yourself. I found this recipe in one of my favorite cookbooks. Martha Stewart’s Baking Handbook has resided in a prominent spot on my bookshelf for the past several years. My deep, abiding love of this book is the very best reason to offer it as my first Baker’s Bookshelf giveaway! To kick this off, I’m offering THREE of you a copy of this amazing book. Please see all the giveaway details in the giveaway box below. You must be a U.S. resident to enter. Please add bakeorbreak at gmail dot com to your address book so that any email from me won’t end up in your spam folder. The winners must respond within 48 hours or another winner will be chosen. Disclosure: This giveaway is not sponsored. I am providing all prizes myself. Love snickerdoodle too! 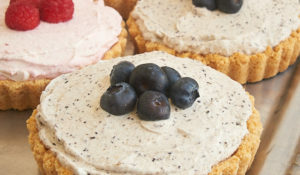 Bite size cheesecake….ummmm, hello?!? Delish! These would make a great addition to a holiday cookie exchange. Wonderful. Now, I am hungry. 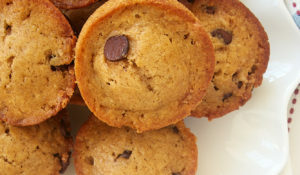 I used to buy these at my grocery store with a chocolate base that had mini chocolate chips in it. It was delicious and I was so sad when they stopped making them/I moved away. Any chance you might make these in a chocolate variety at some point? Looks like a great variation from the old jam standby! I am a big fan of cream cheese frosting so I imagine I’d LOVE these cookies! Such a fun twist on a classic. 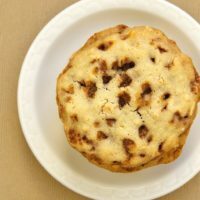 This is such a unique cookie, and I love all things cheesecake! Gotta try these! What a fun twist on a classic cookie. And I love snickerdoodles, so the cinnamon sugar coating sounds awesome! These are genius! I love thumbprint cookies but the jam filling doesn’t do it for me- this sounds wonderful! Love these cookies! Pinned them for later. Wow! I have never heard of adding cheese to cookies, but this sounds delicious. 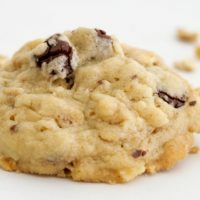 I’m a huge cookie fan, but I’m getting bored of the classic chocolate chip or sugar cookie. This is such an innovative way of transforming cookies into a wonderfully inventive dish! I love how daring this is and I can’t wait to try it! 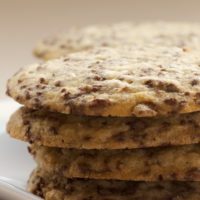 Do these cookies need to be refrigerated for storage, because of the egg & dairy, or can leftover cookies (assuming there are some) be left at room temp? 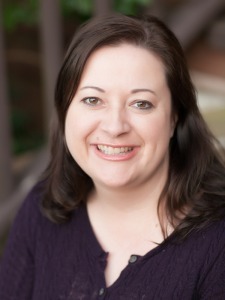 Hi, Jenny. If the cookies will be eaten within a couple of days, I wouldn’t necessarily refrigerate them. I kept mine refrigerated because I knew they wouldn’t be eaten that quickly. A lovely variety for the holidays! Am I reading this wrong or are the cookies spending almost 1/2 hr in the oven? Is that correct? Hi, Chrissy. Yes, that’s right. Keep an eye on them for the second round of baking. They will just need to bake until the edges are beginning to brown.